This post was written by Guilherme Takamine – a student from Fundação Getulio Vargas, who attended IE’s Short Exchange Program: Doing Business in Spain. 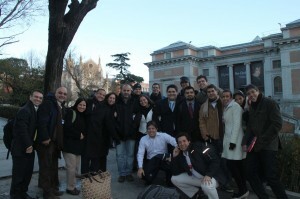 In January 2013, a group of students from EBAPE/FGV’s Executive Masters in Business Administration, of which I am a part, had the opportunity to understand a bit about Spain, its culture and business environment. Within IE Business School and with the help of its experts, “Doing Business in Spain” was an enriching course, that added value to my personal life, as well as my academic and professional career. The classes covered important points in terms of executive training. We were able to walk around and see historical landmarks of Madrid, visit some of Spain’s most important companies and even got to see live Flamenco music. It was very impressive to be able to understand a bit of the Iberian culture, its origins and the way business is done in that part of the world. During classes it was inevitable that questions were raised on what it is like to conduct business during the current financial crisis. To hear from IE’s specialists and from people who live in Madrid, the different points of view were extremely valuable for our training. Brazil and its executives have much to learn from Spain and its remarkable drive to overcome the various challenges posed by these difficult times. Another point of great importance during our trip which is worth noting was the contact with the School itself. IE is a place where you can “smell” entrepreneurship. To be able to see Area 31 and its incubators, as well as the school’s teaching method, provided to us FGV students an insight into how well entrepreneurship can be taught if an adequate space is provided. Last, but not least, the trip gave us an opportunity to meet incredible people, from various parts of the world. In a nutshell, the program was of great value to us, as it gave us a chance to rub shoulders with great minds, students and alumni who, just like us, seek to develop their knowledge within the area of administration. 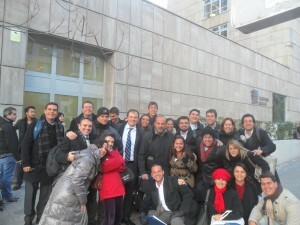 The knowledge and education acquired during this period in Spain was excellent. I do hope I’ll be able to go back and stay a while longer to seek answers to some of the questions that remained back in Madrid.